Maybe it’s my Pinterest obsession, maybe it’s trying to make my home as instagram-worthy as possible. But earlier this year I decided I wanted to create a little coffee/tea station in the kitchen. Partly to try and encourage Ollie to stop leaving tea bags or coffee spoons on the side and partly to just make it a more organised and friendly space. 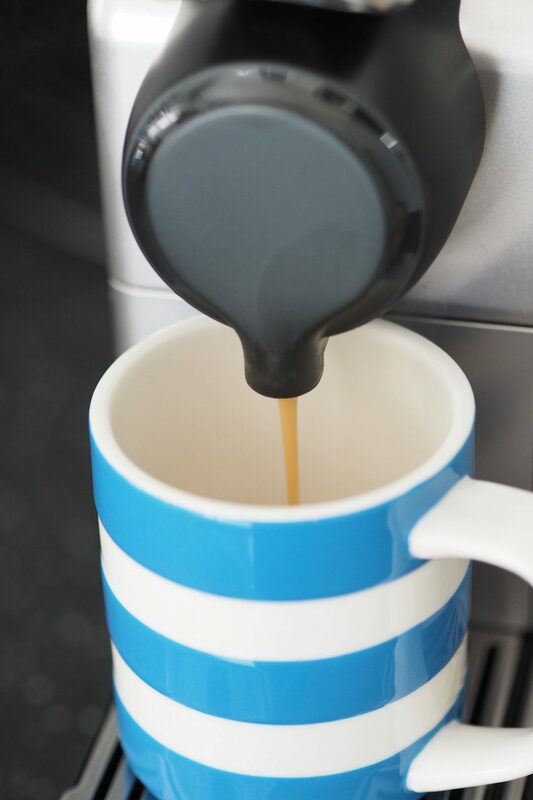 Making sure all the essentials are within reach so you can whip up a fresh brew in no time at all. I now have the ultimate finishing touch of a brand new Nespresso DeLonghi coffee maker courtesy of AO.com and I can’t even tell you how much of a difference this has made. We did actually have a VERY old Nespresso machine previously – one we’ve had since around 2009/10. In fact, Ollie recalls being in the Nespresso store on Regent Street stocking up on coffee pods and being told by the Nespresso staff that he had one of the longest memberships they had seen. I think it’s safe to say, he’s a coffee addict and LOVES a good coffee. I’d go so far to say he’s a bit of a coffee snob and definitely a die-hard Nespresso fan. He’s mentioned about upgrading the machine a couple of times over the years though because we wanted to be able to make shop-quality cappuccino at home. Which is exactly what this new addition to our tea/coffee station does. The new gadget is SO easy, you definitely don’t need to be a trained Barista to serve up a delicious coffee. 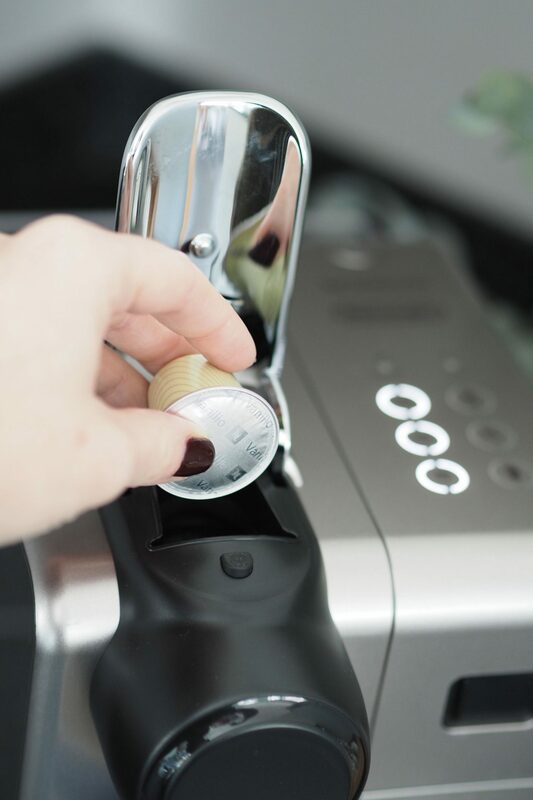 Various settings from espresso, to latte or x – all just a button away. The best bit is the easy milk frothing part. Not the technical term, but this baby just pops on the machine and press of a button later and you have the perfect coffee/milk combo that you’re after. Then you can just pop it back off and store in the fridge for next time. Keeping the milk fresh and the coffee frothy! Plus the machine looks all slick and professional. We have the silver version but it’s available in a selection of colours and the best bit? It’s on a bit of a mega-discount at the moment on ao.com – reduced from £199 to £119 (saving £80). Pretty perfect if you want to treat a coffee-fiend for Christmas maybe? Creating a tea or coffee station at home is really simple. All you need is a few little additions to group the essentials together and create an organised and easy to access spot. Of course placing the tray with essentials on a counter top near the kettle and coffee machine is pretty sensible. I popped ours in a little nook and then used the cupboard above as the home for all our mugs (all totally mis-matched) along with extra tea bags, herbal teas and sweetener. So they’re within easy reach but not cluttering up the surface at the same time. Making sure you have the items you reach for most often on the tray, but the lesser-used items stashed nearby but away is the perfect way to make it practical but tidy at the same time. I love our little coffee spot and now we have the new snazzy machine I’m delighted that I can join Ollie in the at-home coffee treat. I’m not a daily coffee drinker as I only really enjoy it when it’s a proper cappuccino or flavoured coffee so having this means I can make the types I really enjoy!